For more than two decades, conservation biologist Krithi K. Karanth has studied the human dimensions of conservation in Asia—human-wildlife conflicts, land use change and the relationships between people and parks. 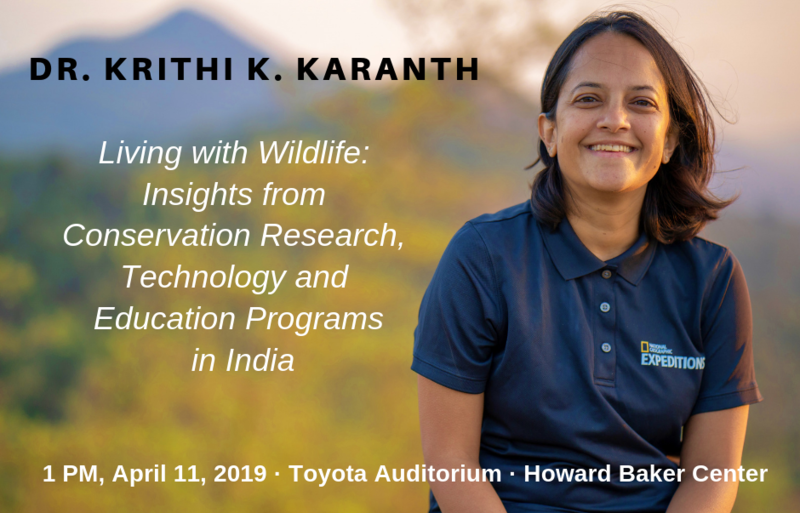 In April, NIMBioS and the Howard H. Baker Jr. Center for Public Policy are excited to host Karanth in a talk on her conservation efforts in her native India. “Living with wildlife: Insights from conservation research, technology and education programs in India” will be held at 1 p.m. in the Toyota Auditorium (Room 103) at the Baker Center, 1640 Cumberland Ave.
Karanth’s talk will focus on projects that have applied conservation science to understand and develop interventions addressing human-wildlife conflict, wildlife connectivity and education in India. She will share stories from Wild Seve, which services more than a half million people and has helped 13,500 families file and receive compensation for wildlife losses from the government; Wild Kaapi, a wildlife friendly certification program that launched the world’s first wildlife friendly coffee company; and Wild Shale, a conservation education program being implemented in 300 schools in rural India. Karanth is Executive Director of the Center for Wildlife Studies in Bangalore, an associate conservation scientist with the Wildlife Conservation Society in New York, and an adjunct assistant professor at Duke University and the National Centre for Biological Sciences. She has published more than 90 scientific and popular articles and has served on the editorial boards of the journals Conservation Biology, Conservation Letters and Frontiers in Ecology and Environment. She has mentored over 120 young scientists and engaged more than 500 citizen science volunteers. For her contributions to science, in April, Karanth will receive the prestigious 2019 Women of Discovery Award, only the second Indian woman to win the award. This entry was posted in research, seminars, Wildlife. Bookmark the permalink.